This dry shampoo absorbs oil and leaves hair light and cleansed. Gentle dry shampoo is formulated to clean hair without water. Shake well before use and evenly spray a small quantity of powder 30 cm from the hair. Leave for 2 minutes and brush out thoroughly. Avoid inhalation and contact with the eyes. I had nearly given up on dry shampoo because I never felt like I was getting the results that others were. Regardless of how I used the product, I was still stuck washing my hair every other day. 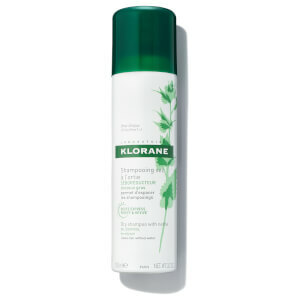 Enter Klorane dry shampoo. GAMECHANGER. I love that it doesn't make my hair look grey, doesn't leave a powdery residue and doesn't have a strong scent. This is a wonderful product! LOVE this product! Saves time and effort in the mornings or day-to-day activities when you're in a rush. Soaks up all the grease!! This was the worst product ever! Hair was dry and dull and this product took three shampoos to get out!Baby powder works far better!!!!! Gonna wash that grease right out of Mom's Hair! A few spritzes revives Mom's fine, thin hair from being plastered to her scalp to grease free and fluffy. Other residents in the nursing home comment on how much nicer her hair looks and how nice it smells. I wasn't sold on the concept of aerosol dry shampoo, but successfully freshened second day fringe confirmed that Klorane is worth the price. Adds volume without as much buildup as powdery formulas. I started using dry shampoos because I wasn't supposed to wash my colored-hair everyday, but I have really oily hair and need a fix for those in-between days. I've tried plenty of dry shampoos: Psssst, Tresemme, Ojon, KMS, Lush, etc. 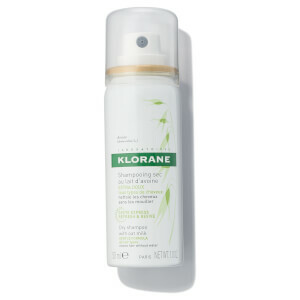 I have to say that Klorane is by far the best in absorbing excess oil. It does spray white but goes away once your rub it in. And it gives you good volume. I was originally using the powder but am glad they have a spray version too. Best dry shampoo I have found that doesn't make your hair more greasy. Just turn on the fan in your bathroom, because there are some particles that come out of the can when you spray. I first tried this after a surgery. Since then I've tried others, but always come back to this one because it's the best! It doesn't flake or smell bad and it adds volume. I couldn't be without this! Salvation for long, tending-to-oily hair! Wonderful product! Quick and easy, and doesn't leave behind much of any scent. I have very, very long, thin, fine hair that I don't want to damage by daily washings, but at 35 my hair is still oily by the next morning. I started by using baby powder, then discovered the dry shampoos like ppsssst, which has a very chemical scent and it takes a lot of spraying to work. Then tried Oscar Blandi powder, which I like a lot, but I wish that the lemon scent weren't so strong. Wish I'd found this first. A little goes a long way -- a couple of sprays at the oily patches and you're done. And there's almost no scent -- and nothing unpleasant or chemical. Once I run out of my others this will definitely become my dry shampoo of choice.